• There are 114 rooms and 16 suites. • Bellevue Grill, the Terrasse restaurant, the Bellevue bar. • Meeting Salon Royal, the Salon Du Palais and the Salon Rouge. • Located next to Bundeshaus, the Parliament of Switzerland. • 1865: The original Bellevue Palace was built by the hotelier Carl Osswald, located next to the panoramic vieing point « Bellevue ». Osswald’s sons Alphons and Philipp continued the management in the second family generation. • 1910: It was rebuilt in a neoclassical style, the architects Paul Lindt und Max Hoffmann were inspired by the Hotel Adlon in Berlin. • 1913 November 27: Grand opening of the new Bellevue Palace. During the First World War the Hotel became the headquerter of the Swiss Army. It remained open to the public during the second world war. • 1976: The Hotel was facing difficulties and was bought by the Central Bank of Switzerland to avoid that a foreigner would buy this swiss landmark. • 1994: The Central Bank handed the Palace Hotel over to the state of Switzerland. • 2007: Victoria Jungfrau Hotel Collection is managing the Bellevue Palace. The Bellevue Palace is the host of the annual gala of the Ordre de Malte once organised by the Prince Edouard de Lobkowicz. 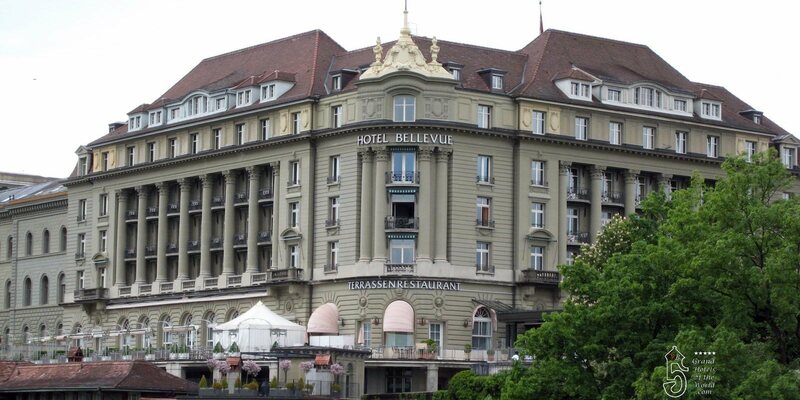 • Ownership: Bellevue Palace is owned by the State of Switzerland. • Management: Since 2007 Victoria Jungfrau Hotel Collection which manages 3 more Grand Hotels in Switzerland, Victoria Jungfrau Interlaken, Palace Hotel Lucerne, Eden au LAc in Zurich.